It's a Life in Pieces Thanksgiving (again)! These are always fun episodes, and are something I look forward to each year. So let's hope this week's episode doesn't disappoint, especially after last week's great episode. In the first story, Greg is at the doctor for a check-up, when the doctor tells him his testosterone level is super high. So obviously, Greg's ego is super inflated by this, and he starts acting like a tough guy at John and Joan's Thanksgiving. He's opening jars, screwing in lightbulbs, and he plays football with Matt. Matt then points out that Greg is breaking out, and Tim tells him that acne is a side effect of high testosterone. Matt then tells him that his increased confidence didn't come from the high testosterone, but rather, from deep inside. In the second story, Joan wakes up Heather to tell her that Colleen is sick, and that she's going to rest and watch the parade. She forces Heather to get up to make food, and when she does, a sleepy Tim grabs Joan and pulls her to the bed, thinking she's Heather. Joan sees that Heather (and Jen and Clementine) aren't going based off of her ingredients, and Joan clearly doesn't like that. She heads in to watch the parade, and is less than enthused by this thing she's apparently never seen but has heard a lot about. Tim is really into it though, and he's angered by everyone else talking. He turns up the volume so he can "focus on the balloons," whatever the heck that means. Joan runs into John on his way to his Thanksgiving bath, and she wants to get a little naughty, but he doesn't want to because his bath is so sacred. Heather tells Joan to go outside and watch Matt and Greg play football. She is also not enthused by this, and she goes back in to check on the ladies making dinner. She tells them how cooking dinner so she can complain about how ungrateful her family is is the true magic of Thanksgiving, and so they let her make dinner. Unfortunately for Joan, they all left, so she has absolutely no help with making dinner. In the third story, Sam is freaking out because her friend gave her a pot cookie. She decides to just act as normal as possible, but that goes right out the window when she walks into the wrong house. She finally makes her way to the right house, but she starts freaking out she is asked to watch Lark. She says that she hates babies, and Tyler offers to help her watch Lark. He then tells her that he knows she did pot, and that she needs to get it together. The family starts their annual tradition of saying what they're thankful for, and she actually does well. Tim and Heather tell her that they're very proud of her for what she said, and she goes back to the table. Heather then reveals that they are also high, so apparently this entire family just loves drugs. In the fourth story, Joan want to get rid of the family's old turkey carving knife. It was John's father's, and it has tremendous sentimental value to him. John plugs the knife in, and accidentally cuts the table with it. He tells them that it is time for the knife to choose someone new. Matt tries to pull it out, but can't. Greg goes next, and fails as well. Tim goes third, and he pulls it out with ease. Greg's all jealous, but the knife has chosen, so it must stick. Then Tim cuts his fingertip off, and blood sprays everywhere. The knife is on the loose, and nobody can stop it. It's absolute chao, and nobody can stop it. At least, not until John kills it. Tim comes to apologize to John for ruining Thanksgiving, and he drops the knife on his toe. Idiot. 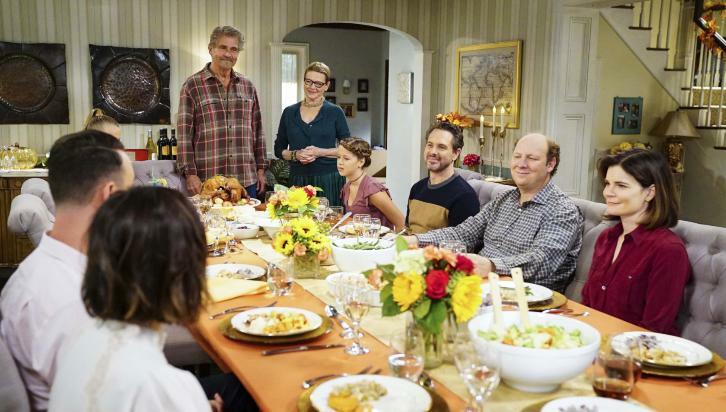 This was a great episode of Life in Pieces, and it was the best of the season so far. I loved all of the stories, and I love the continuity throughout the episode. I can't even put my finger on which story I loved the most, though I will say that the first was my least favorite. And even it was great. Also, Dianne Wiest is a national treasure.